This morning, visit one of the most picturesque spots in all of Canada—beautiful Peggy’s Cove. Its historic lighthouse overlooking the Atlantic Ocean provides one of the most memorable views you will ever see. Enjoy a visit to the ACADIAN MAPLE shop and learn about the history and production methods of making pure Nova Scotia maple syrup. Afterward, journey to the fishing village of Lunenburg, and visit the FISHERIES MUSEUM OF THE ATLANTIC, a UNESCO World Heritage Site. 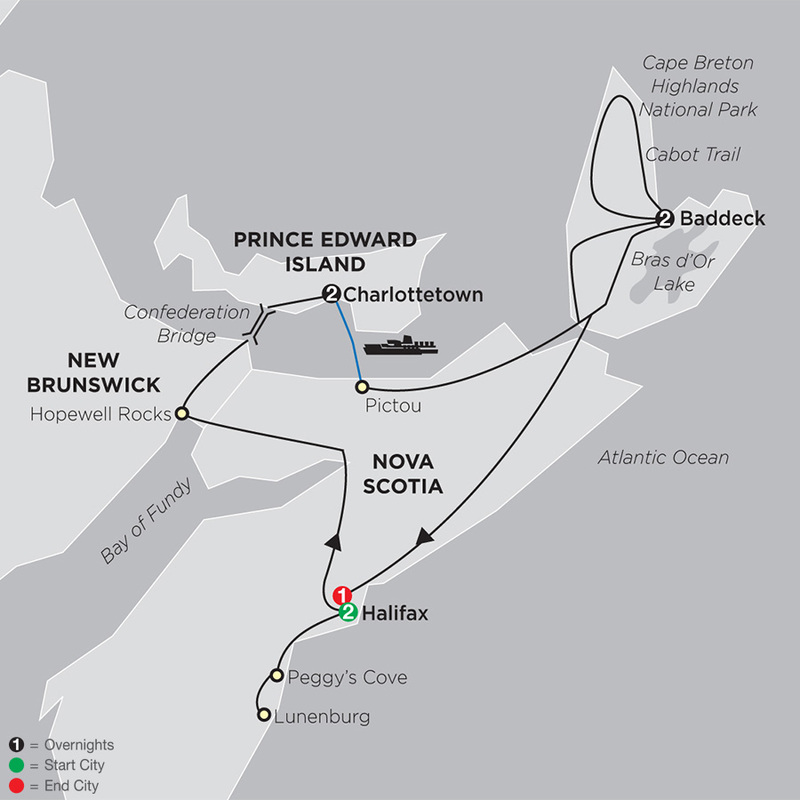 Experience Atlantic Canada’s seafaring heritage on your guided tour of the museum. Don’t miss the magnificent aquarium filled with local species. Afterward, free time to explore the quaint Main Street before returning to Halifax. Complete your day with a sightseeing tour of Halifax’s charming downtown, the waterfront, and Public Gardens. This morning, travel to HOPEWELL ROCKS and enjoy a guided visit to learn about the highest and wildest tides in the world, which rise and fall up to 52 feet each day. Time and tide have carved from the cliffs and coves distinctive sandstone formations topped with trees. Many of the formations have nicknames inspired by their appearance. Drive across the 8-mile-long Confederation Bridge and onto Prince Edward Island. Your vacation ends this morning. You can extend your vacation with extra nights and explore the Halifax harbor further or board the Ocean train to Montréal. Experience a Prince Edward Island Lobster Supper. This family restaurant has been serving lobster in New Glasgow since June 24, 1958.